Evelyn Ceibert Brown Stewart left this world peacefully at the young age of 99 on April 5. She was born in Charles City, Iowa on Jan. 17,1914 to Frank and Nellie Ceibert. She married Arnold Fritch Brown on June 9, 1930. They had three sons and later divorced. On Nov. 19,1945, she married Omer Denzel Stewart. They were later sealed in the temple for time and all eternity. They made their home in Grantsville where they were blessed with two daughters. Evelyn was actively involved in the church. 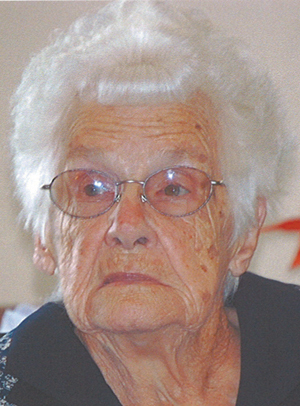 She enjoyed painting, ceramics, going to yard sales and was actively involved with her family. She lived 39 years as a widow and was very independent. She was preceded in death by her husband and two brothers. She is survived by Bill (Lilla) Brown, Jack (Pat) Brown, Jerry (Linda) Brown, Darlene Rouse and Penny (Richard) Anderson, 15 grandchildren, 33 great-grandchildren with one more on the way, and one great-great-grandchild. Funeral services were held Tuesday morning in Grantsville with interment in the Grantsville Cemetery. We would like to thank the loving staff at Rocky Mountain Care and Hospice.